Capri was the favorite island retreat of the Roman Emperor, Tiberius. This itinerary visits the sites of the villas which he built on the island. 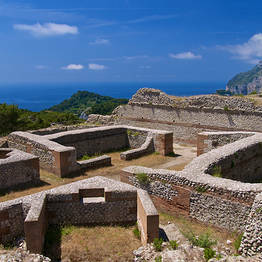 To visit Villa Jovis, the best preserved of the Emperor's villas, start from the Piazzetta in Capri, walk through the town's medieval center, beneath the vaulted arches of Via Longarno, and along the panoramic Via Sopramonte, with its the views over the roof tops of Capri and the sea, then take Via Tiberius which leads all the way to Villa Jovis. As you walk, you catch glimpses, through the wrought iron gates, of the islander's beautifully kept homes and immaculate gardens, overflowing with subtropical plants and flowers. After circa 40 minutes, you reach the archaeological site. Just before the entrance to Villa Jovis is the Astarita Park. The park, with its fabulous coastal pines and Mediterranean flora, is built on a series of terraces above the sea. 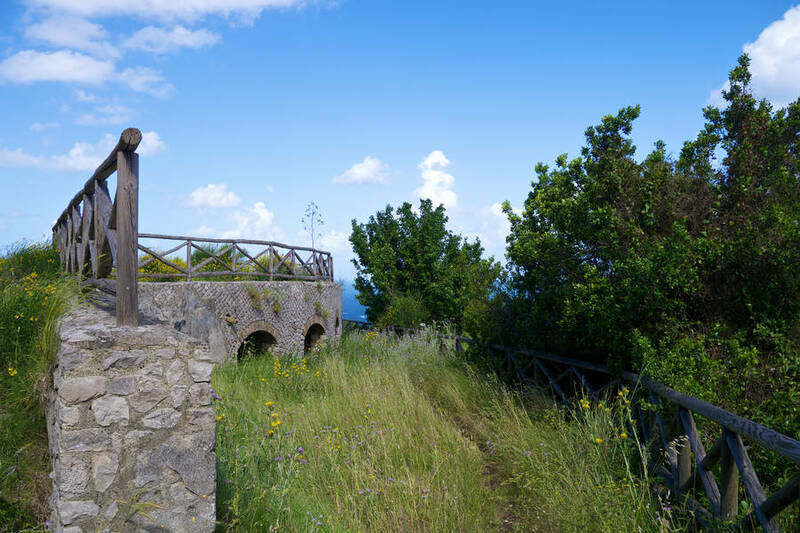 The strategically located Villa Jovis was constructed on the top of cliffs from which there are views of the whole of the Bay of Naples, the islands of Ischia and Procida, the Sorrentine Peninsula and the Bay of Salerno. 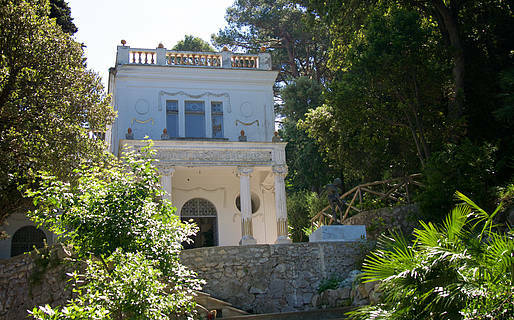 Having visited Villa Jovis, as you go back towards the town center, there is a detour along Via Lo Capo to see Villa Lysis (also known as Villa Fersen, the one-time residence of the French poet and writer, Jaques d'Adelsward-Fersen, which was designed by Edouard Chimot in 1905. 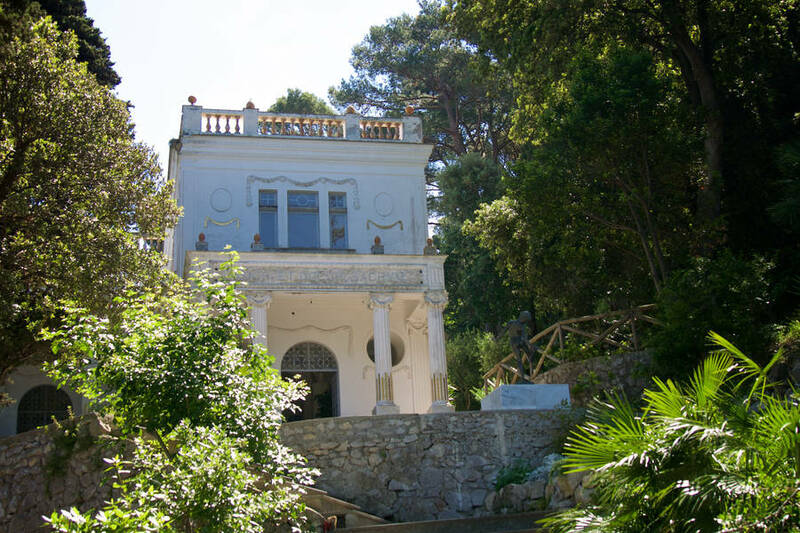 The villa was restored in the 1990's by the Lysis Association and the Council of Capri and is now open to the general public (contact the Tourist information office in the Piazzetta of Capri for a copy of the latest opening hours). The visit to Villa Jovis (including the time needed to walk to the site) will take approximately 3 hours. On the return journey, at the junction with Via Matermania, either head in the direction of the Pizzolungo coastal path or back to the Piazzetta, where the Villas of Tiberius itinerary continues. 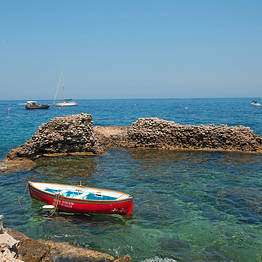 Reach the Bay of Marina Piccola for a dip in the sea. Indulge in a designer shopping spree. 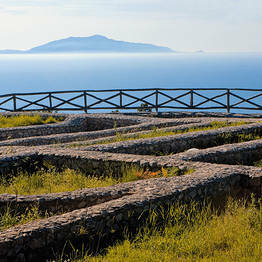 The second Ancient Roman site on this itinerary, Villa Damecuta, is located in Anacapri, the island's second town. 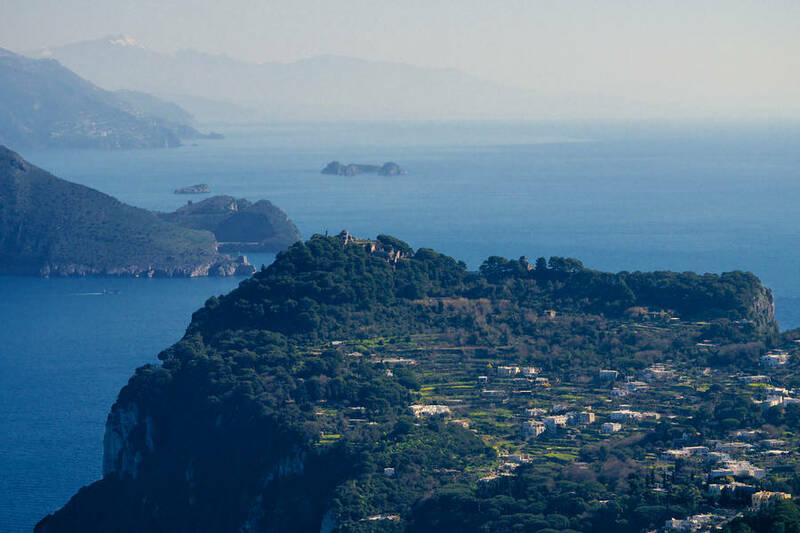 To reach Anacapri, take a bus from Capri (the main bus terminal is situated just a few steps away from the Piazzetta) and get off at the stop by Anacapri's cemetery (cimitero). From here catch one of the buses headed to the Grotta Azzurra and get off at the stop nearest to Villa Damecuta. Those who prefer not to use public transport can take a taxi direct from Capri to the archeological site. Buses leave approximately every 20 minutes and tickets can be bought on board. The journey to Villa Damecuta lasts less than 10 minutes. To reach the ruins, walk through pine trees, along a short stretch of road. 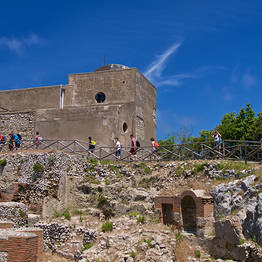 On the way you come to a tiny medieval fort and a viewing point overlooking the Bay of Naples. 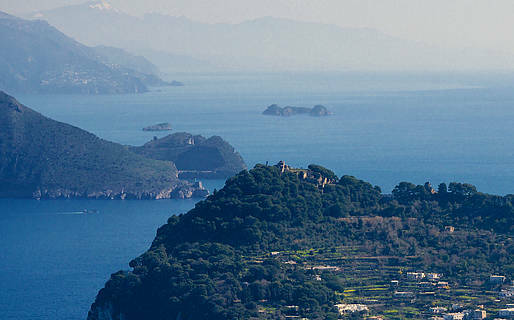 Having completed the visit to Villa Damecuta (approximately 2hrs including the journey to the site), either continue down to the Grotta Azzurra, by bus or on foot, or return to Anacapri. Those who decide to head to the island's most famous sea cave on foot, can choose to walk along the road or take the panoramic shortcut, along a dirt track, which starts at the beginning of the road to the Villa Damecuta. 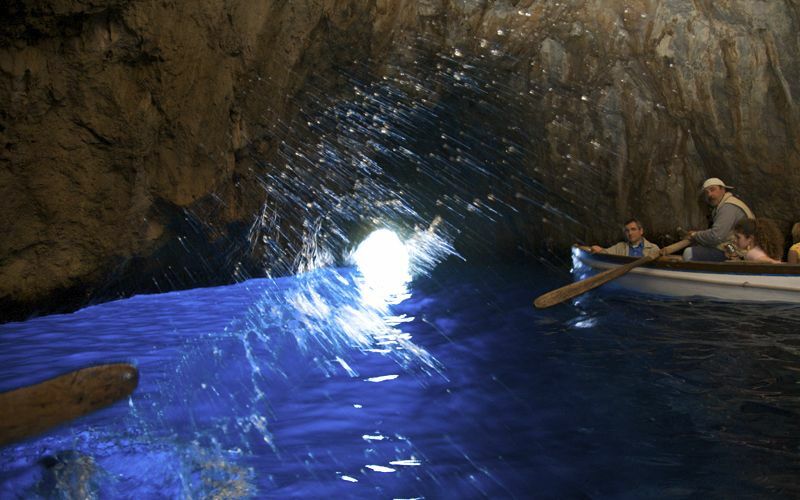 In the parking area close to the Grotta Azzura (where the buses to and from Anacapri stop), visitors can buy tickets to enter the cave (aboard a tiny rowing boat). The cave is open to the public until approximately 17.00hrs. The sea around the Grotta Azzurra is ideal for swimming, either in the attractive little inlet of Gradola, or at one of the bathing establishments such as Il Nettuno and Il Riccio, this latter famous for its fabulous sea-edge fish restaurant. 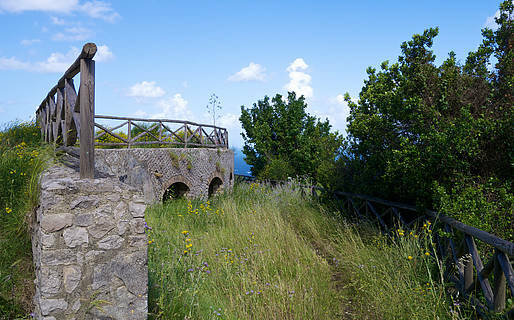 Alternatively, after the visit to Villa Damecuta, head to the Bagni di Tiberio beach, to see the remains of another Imperial Villa, this time almost on the water's edge. To reach the beach of Bagni di Tiberio from Anacapri, you can take the bus direct to Marina Grande and ask the driver to let you off at the San Costanzo stop. Alternatively, you can catch a bus to Capri, followed by another to Marina Grande (making sure this latter follows the San Costanzo route). A leisurely 30 minute walk will take you to the beach. The route passes by Capri's famous Da Paolino restaurant, so it is a good idea to follow the signs for the restaurant and continue to the beach from there. The road skirts past two football pitches. At the end of the second pitch, known as "Campo Vecchio", steps lead to the Bagni di Tiberio. At the Bagni di Tiberio there is a bathing establishment with a snack bar and an excellent restaurant. There is also a free beach, suitable for children. The return journey can be made on foot or by boat, using the shuttle service provided by the bathing establishment. The boat journey (to the port of Marina Grande) lasts approximately 10 minutes.